Ok, there has been a lot of fuss about marketing apps lately. And it seems to work for quite a number of apps, which were previously struggling to attract users. But here’s is the thing about it- it seems like a complex and tedious process. At least to the bulk of app developers. Well, that’s partially true- but have you heard mobile app marketing services? Let’s take a minute to think this through. Mobile app development requires extensive programming skills and some level of finesse. It’s fairly complicated. Probably way more than marketing. We’ll give you that. If it was easy, and less cumbersome, the average age of app developers wouldn’t be 34 in the U.S, and 32 in Europe. Evidently, it takes quite a number of years for most tech gurus to progressively cultivate just the right skills to build solid apps. The first step is usually identifying a problem and corresponding possible solutions. Coming to think of it, many people in the tech world have already been through this stage. This is when you sit back sipping coffee, and think of an app idea that could make you ‘rich’. Fair enough. Even with millions of apps in the app store, there are still countless problems that could be solved through new apps. Then the funnel narrows down to the few individuals who actually take the initiative to compile critical data to develop their apps. If you’re reading this, you’re one of them. Hats off to that feat. Now app development is pretty exciting. But it’s also, to a large extent, resource consuming. You need funding and time. Lots and lots of time. That’s why many organizations dedicate teams to this process, while others simply outsource the whole labor contract. And that’s just one part of the app design and development chart. You still have to come up with prototypes, distribute them to beta testers, and analyze results with custom analytic tools. If you’ve done that already, you’re one hell of an app developer. But right when you assume things can’t possibly be any more cumbersome, comes what is arguably critical to the success of your creation- app marketing. We’ve agreed that app development can be super complicated. But the process is not even half as cumbersome as marketing, not by a long shot. Unlike app development, we don’t have figures on the average time it takes to market an app. That’s only because it doesn’t actually end. It’s a continuous process as long as your app is on the App Store. Now imagine shifting between this and actual app support. Of course, wearing several hats is admirable but so is app success. While you worry about reviewing your bugs and developing addition versions with each platform update, you need someone else to manage marketing. That’s the basic principle behind mobile app marketing services. You essentially take advantage of the experts to get your mobile app out there. Just like standard marketing, promoting a mobile app is a holistic process with several strategies that collectively drive users to your App Store page. We’ll walk you through some of the primary ones we’ve successfully used on more than 3000 apps, and subsequently boosted downloads by up to ten times. For actual marketing to occur, regardless of the industry, you must have three elements- the marketer, product and audience. The marketer is your marketing agency, the product is the app, but the audience is missing. Well, with over half a million visitors every week, you might argue that the App Store is a considerably solid audience base. Fair enough, but let’s remember that they are overwhelmed by over 2.2 million apps already published in the App Store. Plus some of them are usually already engaged customers seeking to download or update apps they’ve already heard about. This is the group that predominantly spent $890 million in the App Store during 2017 Christmas week, and $300 million on New Year’s Day alone. Evidently, the already engaged customer base is directed from other platforms. While you could be patient enough to build your own audience on social media, the most effective strategy has always been capitalizing on existing audience bases. Media sites are gold mines when it comes to that. And an app press release is the best way to reach out to their extensive readership bases. The problem is, however, it would ages before editors in top media companies sift through their emails to take a special interest in yours. They are already getting updates from established brands that their readers are most interested in. So, why would they pay attention to you? Thankfully, there’s a simple way around this. Engage a marketing agency like PreApps, which already has strong connections with leading media platforms. As a prelaunch app marketing strategy, you’ll be able to create buzz around your app ahead of the actual launch. Then as a post-launch strategy, you’ll be able to notify people about new developments like updates and app versions. A well-composed and distributed app press release can create a buzz even around a poorly developed application. It will additionally trigger quite a number of downloads from initial users. But that’s the farthest it can go. Hitting the ground running with many downloads can be pretty exhilarating. It usually seems like you’re heading to success. But it’s not guaranteed, at least according to a survey of over 125 million mobile phones. The average number of users lost after installing an app is a whopping 80%. It occurs progressively over a number of days, with the most prevalent ones being the first 3 days. Users drop apps because of two primary reasons- they don’t find them sufficiently engaging, and bugs. Of course, as we’ve previously mentioned, app testing is part of the development process. But, regardless of how good, or obsessive you are as a developer, it’s impossible to fully diagnose your own app. There’s a reason why doctors don’t treat themselves. That’s how Rovio, after years of creating different types of apps, was able to come up with one that ultimately went viral. According to their programmer, they had previously introduced their apps to their friends and family, and all they kept saying was “Ok, it’s a game”. Then it completely changed with Angry Birds. Testers just couldn’t stop playing it. Plus they were able to identify certain elements that needed tweaking before launch. And the rest is history. Now, having your family and friends check out your app is totally fine. But they don’t have the capacity to fully review it, or the marketing ability to reach out to millions of potential users. You need a group of users that will able to raise a flag if, for instance, your app works well on the latest version of iOS but crashes on the previous one. And that’s part of what you get from app review sites. Just like press releases, the level of scrutiny your app gets, and the subsequent buzz is dependent on the actual platform it’s submitted to. That’s why popular platforms are constantly thronged by other developers submitting their apps. And that reduces your chances of being noticed, then consequently picked for a comprehensive review. Fortunately, a good marketing agency can get you through, thanks to their networks with such platforms. And they will subsequently manage the whole app review process to get the favorable details about your app published before launch, enough to get it just the right amount of attention. If an image is worth a thousand words, imagine how effective a video would be in convincing your prospects to just get on with the app. It’s no secret that our preferences on content have been gradually changing. Previously, text seemed good enough. Then as data speeds and gadget hardware improved, people began shifting to images and videos. If you doubt this, take a good look at Facebook. The site has managed to retain dominance because it’s consistently changing with its users. The latest being optimizing feeds to accommodate videos, and we’ve loved it so far. Ultimately, both Google and Apple took the cue and introduced app demo videos in their app stores. A perfectly good way for users to have a feel of your app without actually using it. And that alone makes it way more impactful than the text description. On average, App Store users spend 7 seconds on app pages. They have no time to read through the description. So 70% scroll down all the way to the screenshots. Then 13% choose to go through them, and 3% will be patient and curious enough to actually enlarge the images. Eventually, 1% will proceed to the video section and play it. It may not seem much when we’re talking about percentages, but imagine the number of visitors a well-ranking app receives in a day. It takes quite a number of strategies to take them through the conversion funnel in just a couple of seconds to secure downloads. 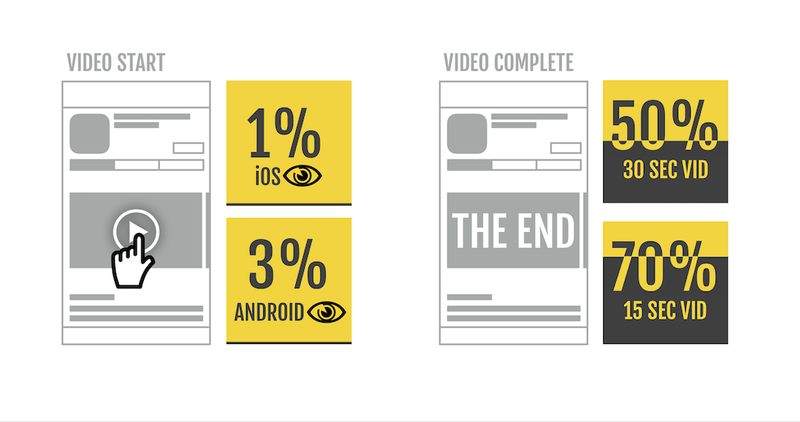 The most effective, when it comes to making an impact, is the app demo video. It’s far easier to convince a prospect through a video than text and screenshots. That’s why your best shot is the 1%. But only under one condition- the video should be good enough and contain just the right info to strategically connect with the audience. Sounds simple. But quite the challenge when it comes to shooting one, considering Apple has a set of strict guidelines, and limit the length to only 30 seconds. Now that’s where the finesse of the experts is needed. The services they provide are meant to create an exemplary video targeting just the right audience with proven sell points. Additionally, they know other third-party platforms to distribute your app demo videos to connect with an even more expansive audience. According to research conducted by Tune, App Store search is the most prevalent method of discovering mobile apps. 47% of iPhone users in the U.S. have tried out new apps after stumbling upon them in the App Store. That alone qualifies App Store Optimization as the mother of all app marketing strategies. Of course, a comprehensive marketing strategy across all platforms is the only way to fully achieve your app’s potential. That said, an app that has prioritized on ASO without other strategies has greater chances of success than one that, say, only leverages social media. App Store Optimization is essentially tweaking your app to get noticed by Apple’s search algorithm. It’s meant to improve your app’s rank in the search results. So if done well, you could even beat established apps that have been in the App Store since it was established. ASO may be the grandest, but it’s also the most complicated. It entails tweaking your keywords, screenshots, and app demo videos, plus leveraging analytics to boost reviews and app usage. The best way to handle all of this, of course, is working with ASO experts. And not just any- Only professions with the right amount of finesse and experience to discern proven tricks from the rest. Previously, the concept of “overnight success” was only an idiom. Then came social media, and everything changed. We’ve seen individuals and products blow up and make fortunate in relatively short periods of time. All thanks to the popularity that comes after going viral. Viral marketing employs the same concept. It entails using some level of social media engineering to trigger conversions around a product. If done well, you could see you’re the popularity of your app spreading like a wild bush fire. That’s how Tinder started acquiring users, and has managed to maintain a steady growth curve through the years. Coming to think of it, there were many dating platforms before it was launched. Plus there are still many other apps doing the same thing, and probably with superior features. But Tinder is seemingly unshakeable, largely due to viral marketing. Now that’s the best part about viral marketing. The hardest is figuring out how to do it, and subsequently gaining the right traction to maintain such a campaign. Paid inorganic marketing may give you some exposure, but it’s ineffective when it comes to the context of viral marketing. You need a strategy that will spark organic conversations around an amusing element relating to your app. That’s exactly what your marketing agency will be seeking to achieve through a series of social media marketing strategies, all tailored to your app. While you worry about reviewing your bugs and developing addition versions with each platform update, you need someone else to manage marketing. A well-composed and distributed app press release can create a buzz even around a poorly developed application. Just like press releases, the level of review your app gets, and the subsequent buzz is dependent on the actual platform it’s submitted to. Viral marketing entails using some level of social media engineering to trigger conversions around a product.